Posted on April 16, 2013 at 10:25 am. The rifle rack behind Sheriff Tommy Denton’s desk was empty. The one-of-a-kind rifle the Sheriff had won in a special Winchester-sponsored shooting contest in Pine Tree Bluffs was missing. The unique prize had been found laying next to a murdered man, a murdered Sheriff to be precise. That was two weeks ago. Sheriff Roy Byrd of the neighboring Council Hills Territory was shot down with the prized Winchester in cold blood. No apparent motive. No suspects. The only clue was Denton’s inscribed gold-plated Winchester. It was a poor attempt to frame the lawman. Denton was never a suspect. First off, he’d reported the rifle stolen from his office a week prior to Sheriff Byrd’s murder. Second, he had practically the entire town of Pine Tree Bluffs as his alibi. Hell, he was one of the most popular and trustworthy citizens, and there is no way he could have left town without someone noticing. The sheriff’s doorway looked out at The Four Aces Saloon across the street. A single jail cell was unoccupied. Two “Wanted” posters hung on either side. One poster had a large black “X” drawn across the face of Kid Belson. The second offered a $500 reward for the capture of an anonymous masked stagecoach hold-up man. Denton sat hatless leaning back in a chair, feet stretched, one folded over the other on a pinewood desk littered with stacked papers, smoking a long, thin cigar. The air was hot. Stale. He heard heels pounding against wooden planks. Cressey looked out over the angry mob. Behind them, running from the area of The Dakota, Pete Williams was waiving his hands. He pushed his way through the men. Breathless, he approached Cressey and Lane. “He’s….g-gone,” he stammered. With exaggerated effort, Sheriff Denton stood up. “Funny thing about the law, Jessie. See, a man’s got to do something wrong before he can be arrested. Being a stranger in town and a resident at The Dakota don’t exactly make the man worthy of an arrest.” Denton looked out and noticed a slow stream of men exiting the saloon, headed toward his office. Cressey spit into a golden cuspidor. “Well, like I said, Sheriff, if you ain’t willing to do your job, why then we’ll take matters into our own hands. I mean, the guy did kill one lawman, one just like you. Now, he’s got another Winchester, mine. We don’t aim to wait for another killing.” With that, Cressey tapped Bob Lane on the shoulder, nodded his head toward the door, and out they went. The growing crowd from The Four Aces congregating outside Sherriff Dentons’s office had swelled to nearly 25. Cressey addressed the group. “Just like we figured men, the Sheriff here ain’t willing to do anything about this thieving and murdering stranger who’s taken up stakes at The Dakota.” He paused, waiting for a reaction from the crowd. Sheriff Denton stood at the entranceway not liking the mood outside. He had both hands on his pistols. As Juan Pedro approached on horseback, the now unruly and angry mob blocked his way. “Let me through! Move!” Pedro yanked the horse’s reins left and right, trying to inch his way closer to the sheriff, but by now the rowdy crowd had surrounded his horse and began dragging the man off the saddle. BANG! BANG! Sheriff Denton had both pistols raised in the air pointing skyward. He again pumped cloud-destined bullets. BANG! BANG! There was no movement. Silence. Everyone, including Juan Pedro looked at the sheriff. “Let that man go right now.” Denton was speaking to the mob but looking directly at Cressey. The men, most stinking of whiskey, took their hands off Pedro and in unison backed away from him and his horse. Bruce Harris is the author of Sherlock Holmes and Doctor Watson: ABout Type (www.batteredbox.com). 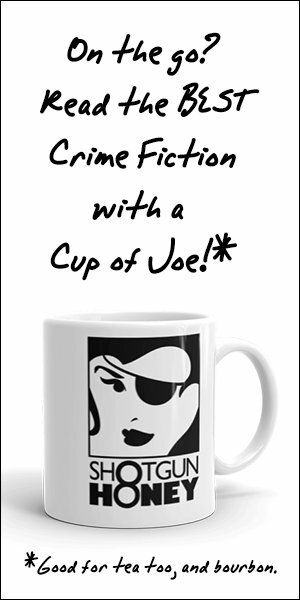 His fiction has appeared (or will appear) in A Twist of Noir, Flash Fiction Offensive, Out of the Gutter Online, Pine Tree Mysteries, Yellow Mama, and Over My Dead Body! “What’s it say?” asked one of the men next to the Marshall’s horse. Before Jessie Cressey could say a word of protest, Bob Lane and a few of the other men surrounded Juan Pedro and Tommy Denton. Both lawmen made did little to resist. The rest of the mob went to work. Within minutes, the bottoms of Jessie Cressey’s boots were dangling inches over the hot, dusty Pine Tree Bluffs dirt.